Behind the Retaining wall - I'm building a barn on a steep slope and love the look of this wall. How was the wall built? Is the wood just cladding material? When you say 3x12 - 3in wide, 12in high and x lenght? Looking to do something similar in our backyard. Thanks in advance. pressure treated structural wall faced with 1x4 stained cedar. Hi, this would greatly depend on soil type, micro climate and how steep the slope is. Can you provide more info? 9. Contemporary wood. 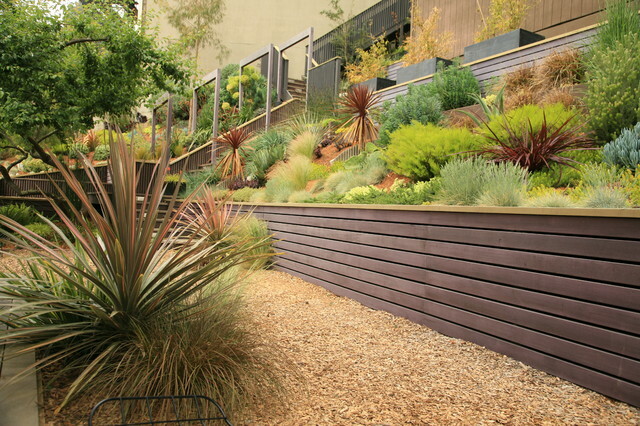 Give a classic wood retaining wall an entirely new look by adding horizontally set wood siding. For this project in the Diamond Heights neighborhood of San Francisco, the landscape architects first established the tiers and retained the steep slope with walls made of 4-by-6-inch posts of pressure-treated wood set into 5-inch-deep concrete piers with pressure-treated boards bolted to the back. Then they added horizontal 1-by-4-inch cedar boards, stained a rich mahogany color, for a contemporary finishing touch. Terraced slope. We will need some.